In recent years, options for “free range eggs,” “cage-free chicken and turkeys,” and “humane certified meat” have been appearing in supermarkets. At this time of year, local health food stores and co-ops display notices for ordering “pasture-raised” or “free-range” turkeys for Thanksgiving. I suppose most people think their “free-range” turkey lived the life of a Monet painting. Their Thanksgiving turkey was free to roam gardens and fields searching for insects and plants to nibble. She spent her days basking in the sun, stretching her wings, and dust bathing before her ultimate sacrifice. 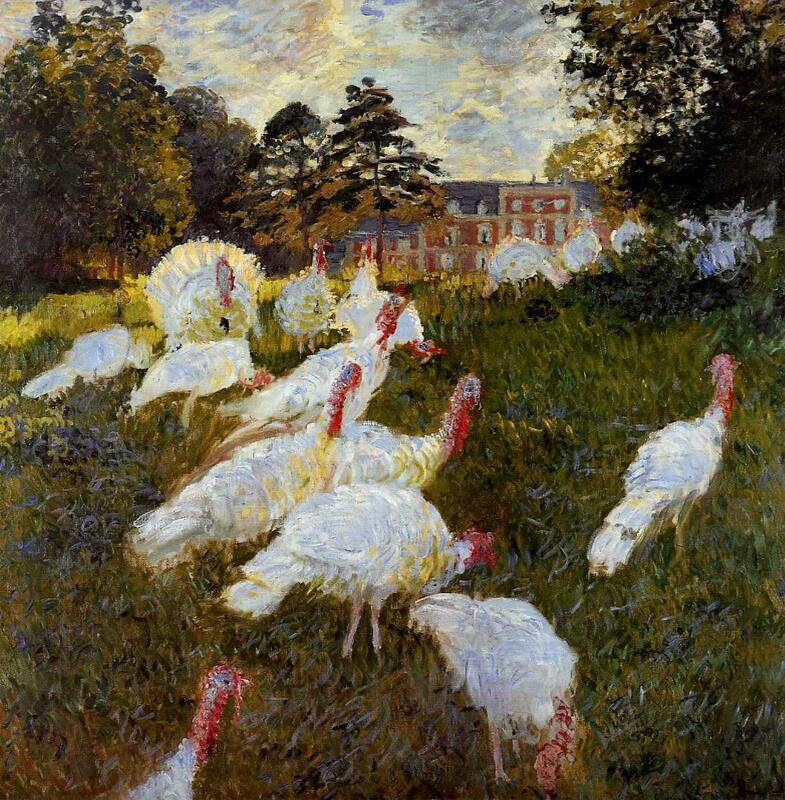 Turkeys by Claude Monet. Painted in 1876. According to the USDA, the terms “free range*” and “free roaming” can be used to describe animals that “are allowed access to the outside for 51% of their lives.” There are no other requirements, including the amount of time spent outdoors, the quality (field or bare earth) and/or the size of the outdoor area. 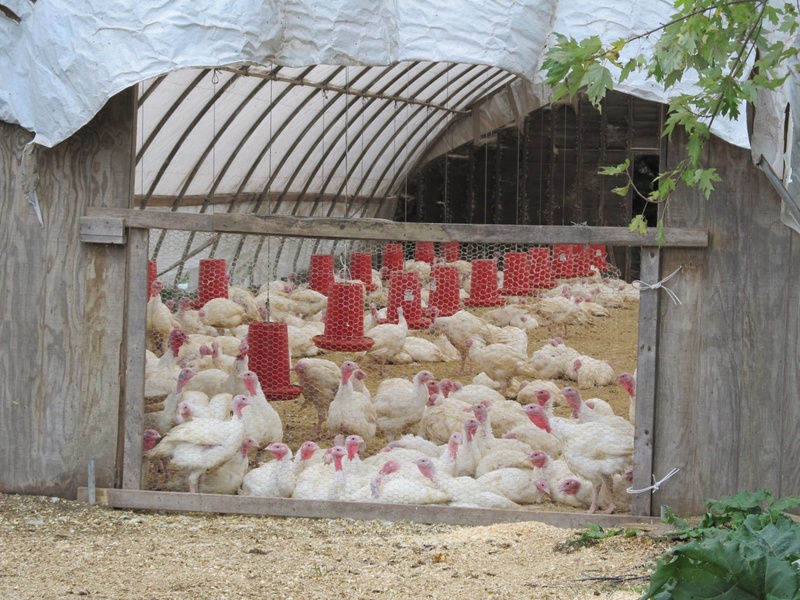 Contrary to what many people believe, “free-range” farms are often no more than large sheds in which thousands of turkeys are crammed together living in their own waste. In addition, many people don’t realize that turkeys raised under these labels frequently suffer through the same painful procedures as those in factory farming operations. It is often routine and standard practice (regardless of whether birds are “Factory farmed,” “Pasture-raised,” “Natural,” “Free range,” and/or “Organic”), that poults (baby turkeys) are debeaked, desnooded, and detoeed. All these procedures are done without any anesthetic. Debeaking slices off approximately one-third of a bird’s beak with a red hot blade. Desnooding, often done with scissors, is cutting off of the snood (the fleshy appendage above a turkey’s beak). Detoeing is cutting off the ends of a turkey’s toes. While more and more “humane” meat options demonstrates society’s growing concern for the welfare of animals raised for food, there still exists the inescapable paradox that killing animals for food constitutes the ultimate act of harm towards these sentient beings.